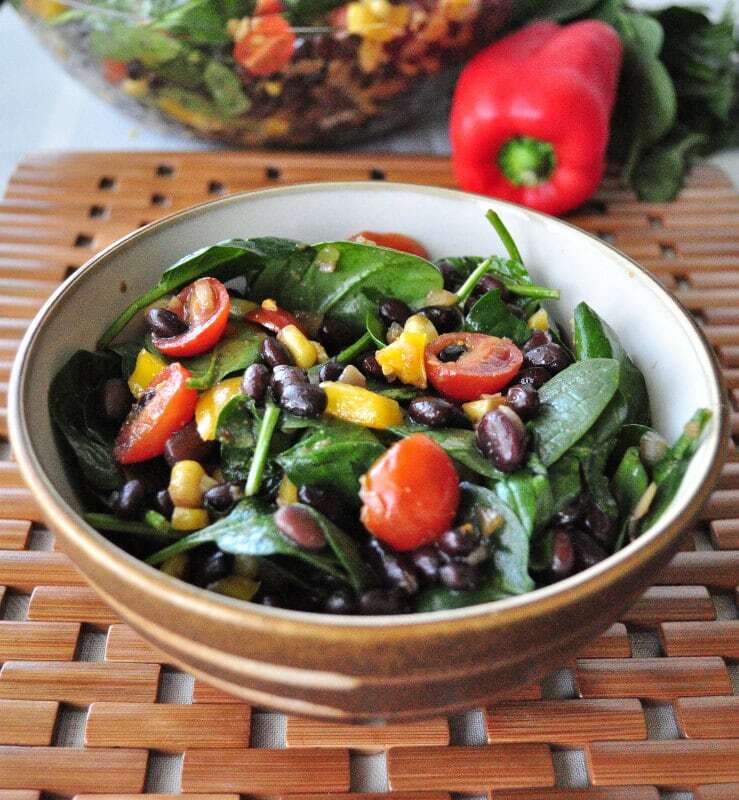 Black Bean and Spinach Salad. 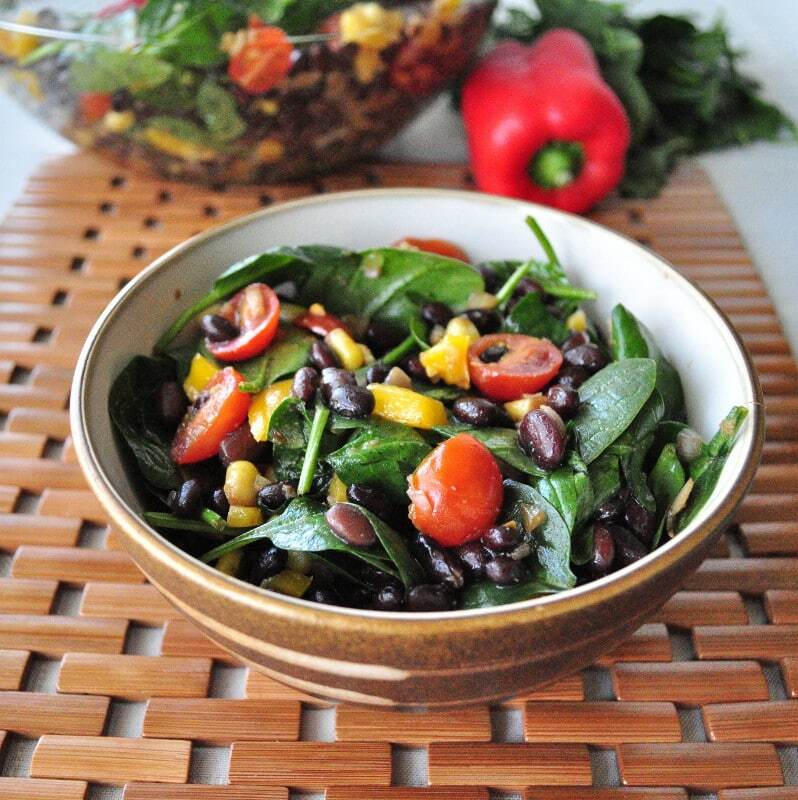 Spring is coming soon and it’s time to say good bye to the soups and hello to salads. This light and fresh salad would be a good healthy addition to any bbq. I love dishes like this. They are easy to make and always a hit. This particular dish was inspired by one that my mother in law made. I made a few changes to the original. This healthy salad is vegan and gluten free too. Throw everything in the bowl and mix. I think it tastes better the next day because the flavors have had time to marinate. This makes a good amount of salad. I would guess about 4 large portions. Should keep for a week, but ours will not last that long. This looks great! I just bought dried beans for the first time (thank you for the inspiration! ), but I'm wondering if dry yields the same amount after soaking and cooking? If I want 2 cups of black beans, do I measure out 2 cups dry? I measured out the two cups after they were soaked and cooked. It's okay if you add a little more or a little less too. That is the great thing about cooking. It doesn't need to be exact. :) If you are using canned beans, it would equal about 1 can. Where can I find avocado oil? You can get it at most grocery stores in the same place as all the other oils. If you want, olive oil can work well too. I hope you enjoy the salad. It's one of my new favorite meals. Where can I find pomegranete molasses? Can you suggest a substitute? This looks delish, can't wait to make it. Thanks. You can find it at most health stores usually in the same isle as all the oils and dressings. Not sure of a substitute. You can omit, but it really does make the dish shine. If you buy a bottle, a little goes a long way. It's great in tabouleh salad too. I have been to (2) grocery stores and a health food store, and haven't been able to find this. Though, I looked in the baking aisle, the health food store had never heard of it. I am thinking about ordering it off Amazon. Is there a brand you like? Also, does the salad get soggy after letting it sit for awhile? I'm never a fan of day old salad with dressing on it because it tastes soggy. The brand I get is from a Turkish market. I would just look for a brand that has a clean ingredient list. If you have trouble finding it, you can try subbing a bit if orange juice instead. The salad will get a bit soggy after a few days, so if you are not going to like it that way, you can always keep the dressing separate. which part is the dressing? It looks like everything is just mixed together. Just the oil and pom molasses? The pomegranate molasses, orange juice and avocado oil. Mmm some of my favorite ingredients altogether in one place - looks delicious! I didn't have access to the pomegranate molasses, so I used regular molasses instead. Is regular molasses just horrible for you? The dressing was excellent! I could imagine using it for a marinade for meat & vegetables for kabobs too. I will have to look for the pomegranate molasses on amazon as another poster mentioned. The pomegranate molasses is much different than regular molasses. It has a fruity flavor. Regular molasses is not bad for you at all. If you get the blackstrap molasses, it has a high amount of iron in it. Here is the link to the pomegranate molasses. It's awesome and it tastes great in tabouleh as well. A little goes a long way since it's concentrated so this will last a while. http://tinyurl.com/k8g292n Glad you liked the recipe! I made this salad previously but did not have the pomegranate molasses. I don't remember what I subbed for it but the salad was good but not great. I have just made it again after finding the pomegranate molasses at Whole Foods and what a difference. Now the flavor is incredible! It is worth seeking out the pomegranate molasses to make this. And I see two other recipes that call for it in your list of recipes. I know I will enjoy using this condiment often. A wonderful flavor.